Dunkirk Dave | World's Second-Longest Prognosticating Groundhog! Welcome to Dunkirk Dave’s Website! Dunkirk Dave has come here to tell you all about himself and his family. Meet Dave's friends Bob and Bill, and learn how Dave, Bob and Bill got to be so famous. Dave also thinks it would be nice if you could sit and visit for a spell, because groundhogs don't get many visitors. Click Here to read all the recent news and find links to recent articles about Dunkirk Dave in other publications! What is a groundhog? Where do they live and what do they eat? How & when did Dunkirk Dave and Bob meet? Who is Bob? Dunkirk Dave's family photos! Audio recordings & video, too! Sign Dunkirk Dave's Guestbook and let him know you were here! The National Geographic organization sent freelance author Aline Alexander Newman and her husband photographer, Neil, here for one day last summer. They photographed Dunkirk Dave and interviewed me and my assistant, Bill Verge. Dunkirk Dave was chosen as an “animal superstar” and his special life will be featured in print and pictures in one of the three chapter animal stories in the National Geographic Kids Chapters book series, Animal Superstars: And More True Stories of Amazing Animal Talents. The chapter book was released February 12, 2013. 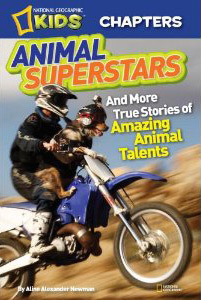 Dunkirk Dave is honored as one of three ANIMAL SUPERSTARS featured in this book! You can order the book at Amazon.Com or Barnes & Noble. The book is available in paperback, hardcover and Kindle & Nook Book eBooks.